Have you found your authentic voice in your work? Do you feel like you are playing the role of someone else in your work or is it the real you? 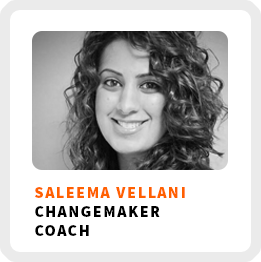 Saleema Vellani will inspire you to discover your authentic self to reveal opportunities you might have never imagined for your career! She’s the founder of Innovazing, a consulting firm that helps changemakers create the lives and businesses they want through consulting, coaching, and training programs by teaching you how to create new mindsets, systems and processes. I like to think of her as someone who helps entrepreneurs find their authentic language for designing their business. And she found her authentic voice by starting several businesses before starting her current one, all centered about language and communication. How she first became an entrepreneur by co-founding a language school in Brazil. Why promoting yourself and your work, starts by doing work on your inner self. How to blend your past work experiences to go after new opportunities. Why practicing your self-awareness helps reveal your authentic self. Wake up time: When her body tells her to wake up. Core work activities + habits: 1) Being proactive in connecting and following up with people. 2) Embracing creative outlets in order to foster creativity for herself and her clients. 3) Taking time for self-care and enjoying life. Ideal work environment: Usually at home, sometimes in a co-working space or a coffee shop if she wants community. 90-day goal: Work with clients with bigger missions in order to increase impact. 1) Be aware of it. Recognize that these are sensations we all have. 2) Trust it. Rely on your gut instincts when they’re telling you something. 3) Stay open to things that are coming your way by being present and focusing on now.